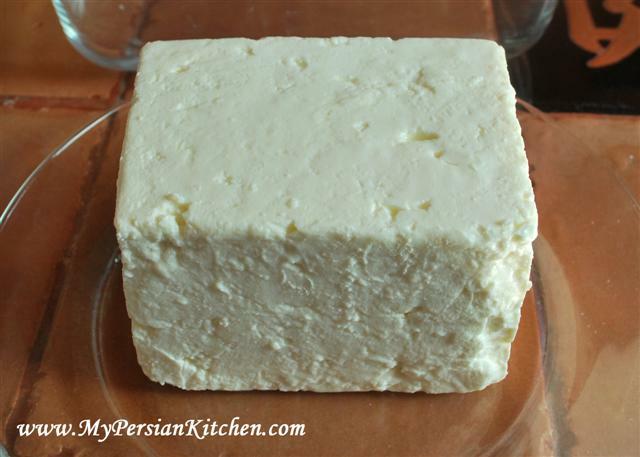 Persians love their Feta cheese. they really really do! I really really REALLY LOVE Feta cheese. 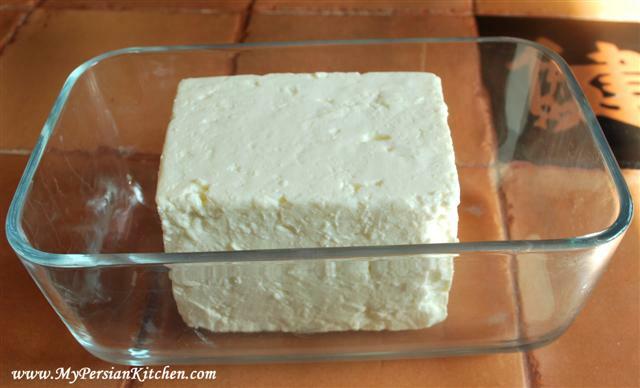 There are three different types of Feta Cheese: Greek, Bulgarian, and French. I absolutely love the French type because it is less salty and milder tasting out of the three. 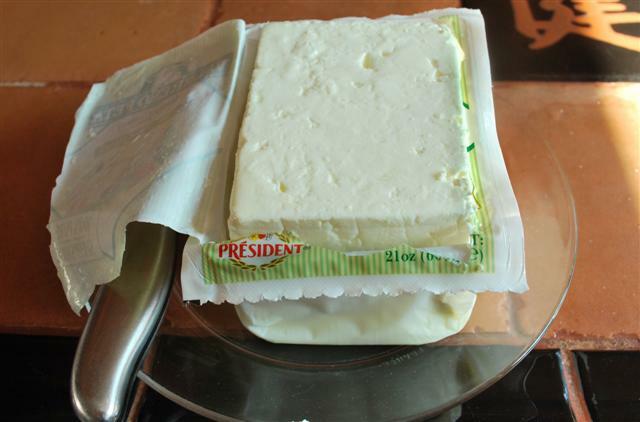 Here is what my grandmother did every time she brought home feta cheese. The first time The Sous Chef saw me do it, he was very perplexed. But we don’t contest what my grandmother did because she was the expert! Now he has learned and does the same thing. I thought I would be ever so nice and pass on the my grandmother’s teachings to the rest of you Feta Cheese lovers! First, boil some water and let it cool down to room temperature. You can purchase French Feta cheese from pretty much any Middle Eastern market. I was extremely happy when I saw that good old Costco started carrying FRENCH Feta cheese from goat milk! Let’s just say that in this household we love and consume feta cheese quiet a bit! 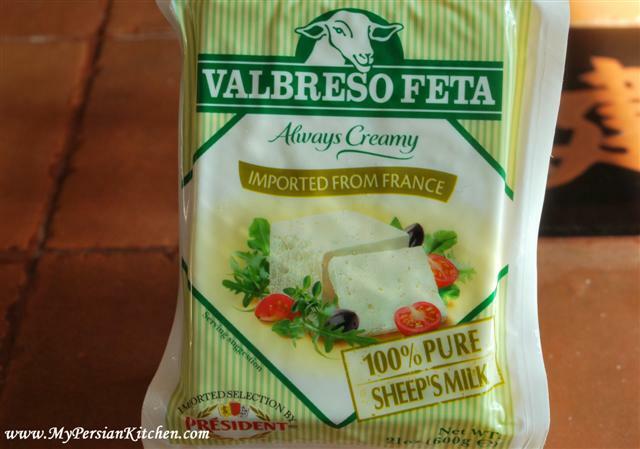 “French White Cheese made from sheep’s milk. Made exclusively from the rich sheep’s milk of South West of France for a creamy and rich taste.” Bless them little cute sheepies! They make my morning breakfast so enjoyable and most definitely something to look forward to. Back to what to do with the cheese. Open the package. Remove the cheese! Look at it, so gloriously white! 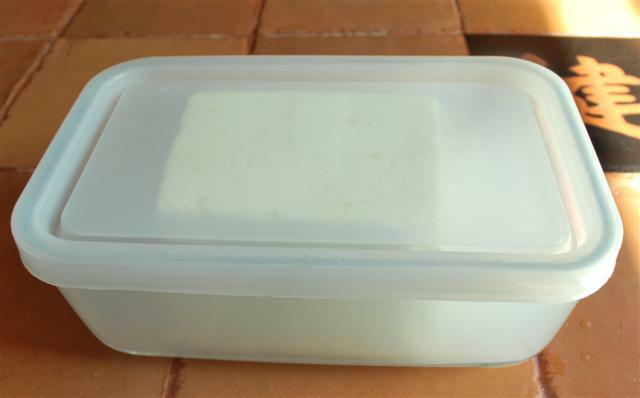 Place in a deep container which has a lid that closes tightly. 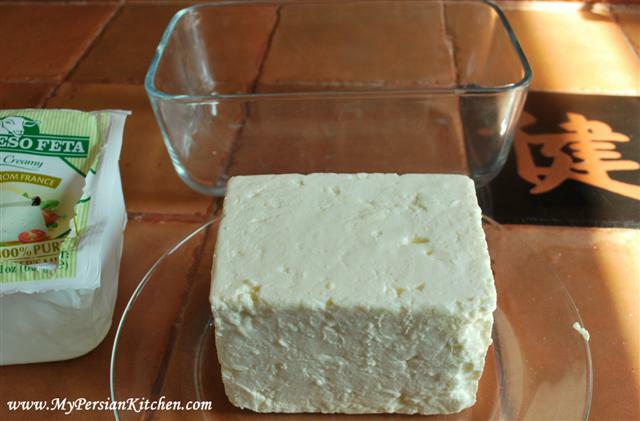 I love this glass dish, it is perfect for our enormous block of Feta! Close the lid and palce in the fridge. 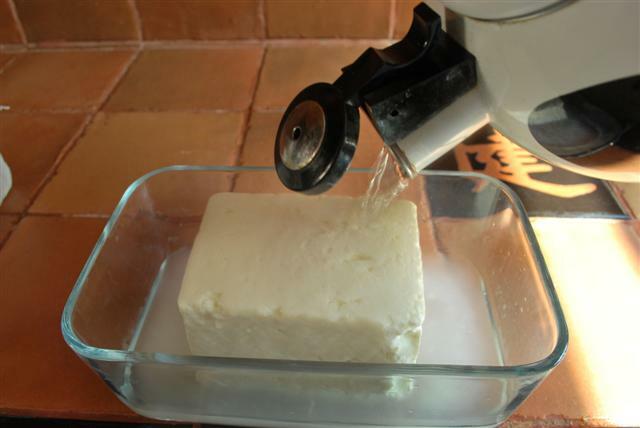 The water helps keep the cheese fresher too! I am so happy to find this information about persian food. I will certainly follow your inspiring writings. I have som gardening friends in Sweden from Iran and they have learned me to love the food. I have a dream to visit Iran, What area would you suggest would be good for a person who likes sabzi vegetables and kitchen gardens. Shortly – where they grow lots of traditional vegetables. That is very interesting. Great idea grandma! Lena, thank you for your comment. Good question, although, honestly, I don’t have an answer. Sabzi is readily available all over Iran since it is consumed daily. Do other readers have an answer for Lena? Lori Lynn, let me know when you are in the area, I would love to meet you! There’s nothing better than a few pats of French feta, some cracker bread (or toasted barbari bread), and some black tea in the morning. Breakfast of Champions! Thanks for the post. I would always store the cheese with the water that it was packed in, but your Grandma’s way is much better. that is indeed my most favorite breakfast of choice! Thanks for the tip on French feta. What a smart way to store the cheese. 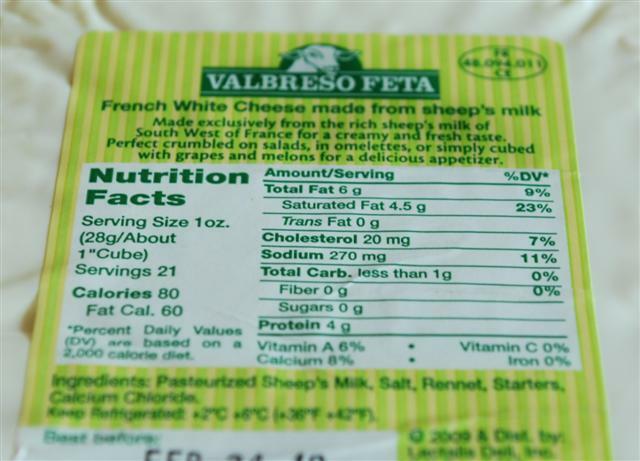 And I gotta say–that little sheep on the package is totally adorable. Awwww! Some of my family members make their own goat’s milk cheese using milk of goats they have. It’s quite amazing. Re. Lenas question I’ve always heard that the Northern part of Iran is quite lovely and “green”. Esp. in spring when some-kind-of-orange trees are in bloom. But not having been there I really couldn’t say. Bria, agreed, the goat is super cute. How lucky are you to have family that makes their own goat cheese. I have not doubts in believing that it is amazing. Tine, now worries about the long comment. Hopefully Lena will reply back! Congats on mastering Ghormeh Sabzi. Zereshk Polow compared to Ghormeh Sabzi is a breeze!!! Yes Tine, I´m the Swedish Lena you think I am. I´m also sure Iranian kitchen gardening and cooking is extremy interesting . I have some Iranian friends in Sweden. They are allotment gardeners and it´s thanks to them that I have understood what a treasure the iranien kitchen gardening culture is. They inspire me a lot,gives me new ideas of what to grow and also how to grow. They are nothing but proffessional amataeurs. One of them is a former Iranian wrestling champion. Of course he loves sabzi. The problem is that I don´t know if they will let me in. I´m waiting for visa. During the time I get even more inspiration, especially from mypersiankitchen.com. Lena, you are very kind! I hope you get a visa to go to Iran. I would love to hear all about your trip. Katie, I don’t remember seeing Feta Cheese in oil and herbs in Iran either. I think it’s a Western made recipe.